Click to see the full-sized visualization. With Election Day fast-approaching in the US, many of us are looking to the data. Andrew Hoagland and Mike Cisneros created this impressive viz to explore how battleground states might swing come Nov. 8. They looked back at past performances of pollsters to create this prediction model based on more than 20,000 simulations. Check out the cartogram on the left, which shows states sized to reflect the number of electoral votes at stake. According to this model, Colorado is leaning Democrat while Ohio is leaning Republican. 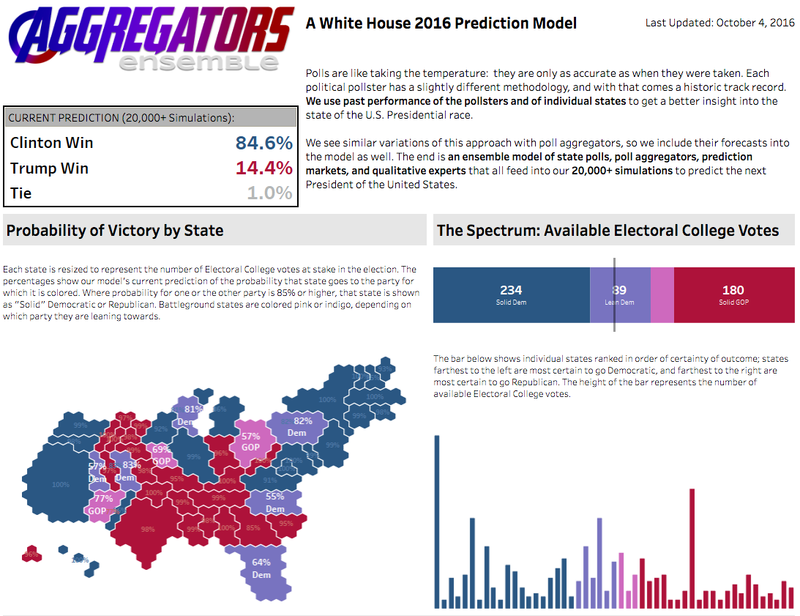 For more election-related data stories, check out our #ElectionViz gallery. And to learn how to create cartograms in Tableau, follow this tutorial by Tableau Zen Master Matt Chambers. The Data School Residual Plots in Tableau–Why Are They So Important? Storytelling with Data Do You SEE It? Do you blog about Tableau? Let us know in the comments below or via Twitter @tableau!